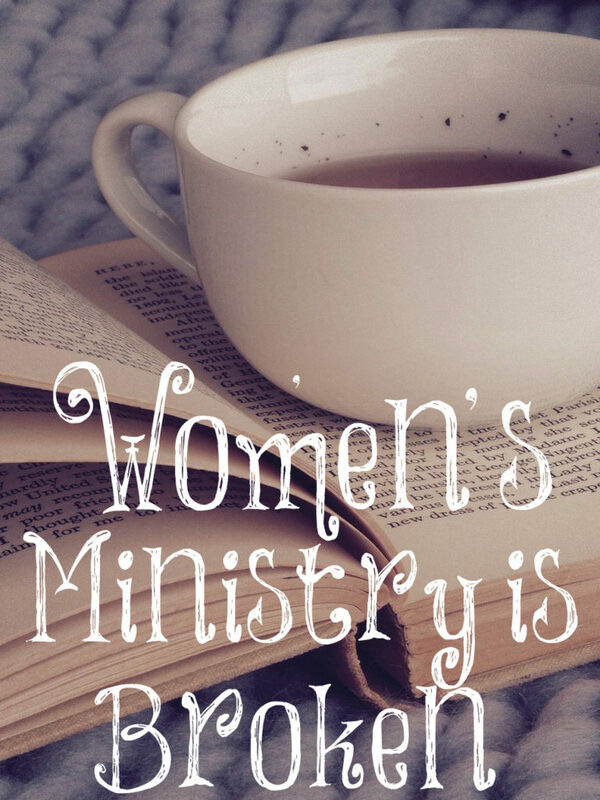 To address this problem we have the never ending series of “women’s ministries.” Women flock to these “ministries” in the hopes of gaining some sort of “breakthrough.” They are taught their purpose can be realized by either starting their own “women’s ministry” or working within one already established. The entire paradigm of the “women’s ministry” is broken. It’s a vicious cycle. Women are trapped in the lies of feminism and find their Christian lives to be unfulfilling. They seek answers from a “women’s ministry” and are ultimately taught they will find fulfillment by involving themselves in “women’s ministry.” This doesn’t address the calling of the Christian woman and further obscures it. A Christian woman should be taught to find her calling first and foremost IN HER HOME. The domestic duties of the home are her sphere of Christian leadership, for she is to be a “keeper of the home.” Her first ministry is to her husband and children as she loves and serves them as a Christian wife and mother. This is WHO the Christian woman ought to be! I don’t think Proverbs 31 works as a good proof to encourage women to work outside of the home however. All of the things mentioned are part of the fulfillment of her domestic duties (which are quite extensive). It also speaks of the incredible competency of the godly woman. That said, I realize there are many women, married and single who have to work outside the home. I’m sure this was a reality in the 1st century as well. Does this then negate the calling of women to the home? What about single women? I was not particularly addressing single women nor do I feel that I need to qualify every iota since the Bible addresses this subject in the same way without stopping to qualify. See Titus 2:3-5…all young women aren’t married with children are they? Did Paul find it necessary to stop and qualify what he meant? The reality is, the Bible is very controversial on this subject today because it speaks very plainly to it and the world hates it. I refuse to qualify it to the point it no longer means what it clearly means which is precisely what is being done today. That wives are to submit to their husbands…somehow today means she has total veto power over all decisions. Wives are to be the keeper of the home…somehow now means train as a young woman for a career, marry, and share the keeping of the home with the husband. There is numerous absurdities like this being passed off under Biblical language. You’re not going see me doing that (by God’s grace I trust). In the context of church history, it is an indictment to how off kilter our generation is that a post such as this would be considered highly inflammatory. I could post some citations from some of the most well respected pastors and theologians from church history on this subject that would make my post appear to be most gentle by comparison. Well at least my wife does not participate in women’s ministries. Thank you Lori once again for another great post. This post reminds me of a book review I just did. It’s the CSB Study Bible for Women. The “Christian” feminists don’t like this Bible for the simple fact the editors (who are women) teach women in the articles and study notes that women are to be keepers at home and submission to our husbands. They complain that women should be allowed to have a career outside the home and yada, yada, yada. True, true, and true again! Great post! Yes, those women’s ministries are so painful…they are supposed to be “the answer” for unfulfilled women, but they only bring on more pain and take one further away from happiness. Often in those ministries there is a lot of envy and back-biting, as women all put together are prone to that. Or, on the other hand, sometimes they get together and try to act like men. In either case, it’s so painful. I think women’s ministry is a good idea if it is done in context of husband and marriage, like women getting together and sharing things that doesn’t concern men. Support one another, but in context of the husband. Or, if there is no husband yet, in that mood. Not in the feminist mood. The problem with Proverbs 31 is that pastors do not teach it correctly themselves and women take it out of context. Proverbs 31 is Indicative, not Imperative. To explain better in this case an indicative is something that indicates who she was already. An imperative in this case is that she does those things (or you have to do those things) and there for she “is” (and you will be too) a great wife/woman. It’s the devil’s lie. Women’s ministries and pastors flip this as they do most things, like Ephesians 5: 22- when in reality it doesn’t have anything to do with the previous verse. Pastors and women’s ministries are laying waste to Bible believing christianity. They use things to guilt husbands and shame families mostly to blame the father/husband. From Hebrews about forsaking the assembly, which has absolutely nothing to do with church attendance. I could go on, but you get the picture. If you believe the bible and truly believe it, then ask yourself why things are in a certain order. 1 Peter 3: starts off with the woman obeying and winning over without a word. THEN it goes on to V7 to the husband. Same with Ephesians. Wives submit to your husband and respect them. Then to the husbands. Look at Genesis after the fall. God turns to Eve first. Then Adam. All of this and yet God is Head of Christ and the Head of man, and man has authority of the wife. I thought his post was very gentle indeed. I love this truth so much! Truth sets us free! It is so liberating to know that I’m not even called to be outside of the home in so called women’s ministries. In our church there is a pull for it, but I’m not falling into it. The books I mentioned in a previous post, and posts like these, voices that speak the truth, are an extremely important and necessary encouragement and help to stay to what’s true and to be able to confidently say no to the lies that pulls us away from truth. I’m so glad you write and share what you do. Thank you!